Is this a police band? Mystery photo. Police outside Royal Pavilion? This page was added on 20/06/2008. Yes it's outside the Pavilion, but to me the proliferation of medals suggests that they were post 1914-1918 army rather than police. 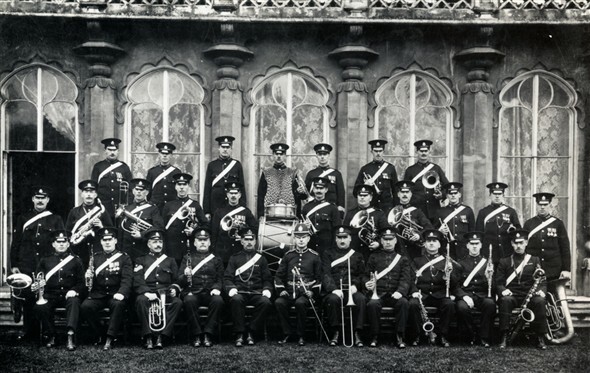 I have a copy of a similar photo showing another band outside the Pavilion, but the publication I found it in (dated 1894) stated that the band was made up of men from the local reserve. Police Bands do exhist and the fact that several of the bandsman are wearing Pith Helmets tends to bear this out, however to my knowledge Brighton has never had a Police Band, if I am wrong then please don't hesitate to inform me. To my knowledge most of the Police Bands tend to be in the Midlands or the North of England,hope this is of some use to you. Judging from the uniforms, the badges of rank, the medal rows, forage caps and uniforms, this is definitely a military or militia band; post 1918. Was this taken by FJ Tanner? He took similar photos of uniformed groups. He is my great grandfather and was a professional photographer based in St James Street until the 1930's.